Long story short, I had a 1998 Cherokee with 248,000+ miles that held up and ran like a sewing machine. Was sold regrettably to a nephew for a college car (which he later traded in for something else). Got a Grand Cherokee (1999) with 150K miles that ran like a sewing machine again, but was disappointed in the power, must have been the extra body weight in the style. Next bought a Grand Cherokee 2006 Hemi. Whoa talk about power, but it had issues and traded for a 2003 BMW Z4. Now that was a mover, but only room for two. As family needs changed and it was a Sunday car besides I purchased a 2010 Honda CRV XL AWD with the works. What a mistake! Many problems, issues and would never recommend. Crazy "hobble bobble" generating from the rear. Have taken it to the dealer without resolution. 'Oh that's the nature of the vehicle' they said (Oh sure dude and I was born yesterday too). After which they replaced the drive-train which was bad yet still has the "hobble bobble". It goes back to the dealer on Monday again. May have to use the Lemon Law. Anyhow, finally...I got a 2004 TJL 4.0 and I'm now back in business. Perky, reliable, 3 top options, hard/ soft and bikini. The longer body without 4 doors made for a less "hoppy" ride than the (standard) Wrangler and allowed hauling stuff possible. It's straight forward and no frills of course, but I do love it and have been waiting a long time to get the one I wanted. Can't say enough about the 4.0L as they built them to last. Hope to have this one a very long time! Thinking about putting a performance chip in it, and a turbinator(to save on gas). I've already had a larger air intake installed as well as a larger exhaust system. Sounds nice but not too loud to be annoying. Why do I like Jeeps? 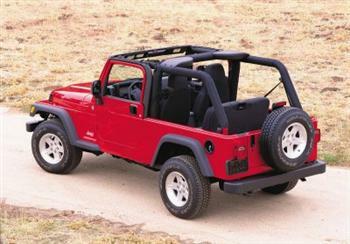 They're simple, reliable, convertible options, room for 4, winter/summer vehicle, and cute of course. Another biggie...I drive many a highway mile and as many cars as I've seen broken down on the side of the road I can't remember ever seeing a Jeep Wrangler or TJL.